No. 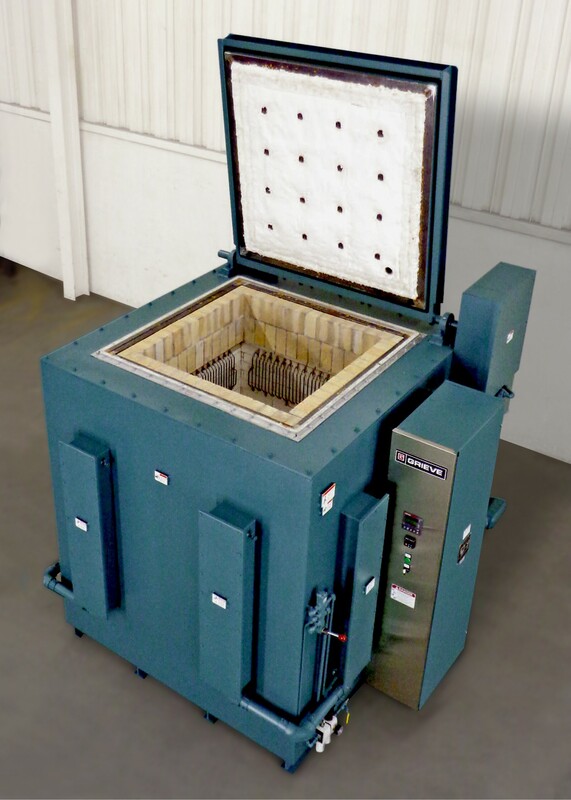 1040 is a 2200°F (1204°C), inert atmosphere pit furnace from Grieve, currently used for heat treating automotive parts in baskets at the customer’s facility. Workspace dimensions of this furnace measure 36” wide x 36” deep x 48” high. 78 KW are installed in heavy gauge, high temperature Kanthal AF alloy wire heating elements of rod overbend design and powered through a low voltage transformer to heat the workload. This Grieve pit furnace has 11” thick insulated walls comprising 4 ½” thick 2600°F firebrick, 2 ½” thick 2300°F firebrick and 4” 1900°F block insulation, as well as an insulated floor comprising 7” of castable refactory and 4” block insulation. Other features include a ¼” plate steel exterior reinforced with structural steel and an air-operated, rear-hinged door. Inert atmosphere construction includes continuously welded outer shell, high temperature door gasket, sealed heater terminal boxes, inert atmosphere inlet, outlet, flow meter and manual gas valve. Controls on the No. 1040 include a digital indicating temperature controller, manual reset excess temperature controller with separate contactors and an SCR power controller.